28 days, 27 shots. One per day, no more, no less…. Our Daily Disposable Contest is pretty straightforward, but here are the guidelines anyway. We’d call them “rules,” but those were meant to be broken. 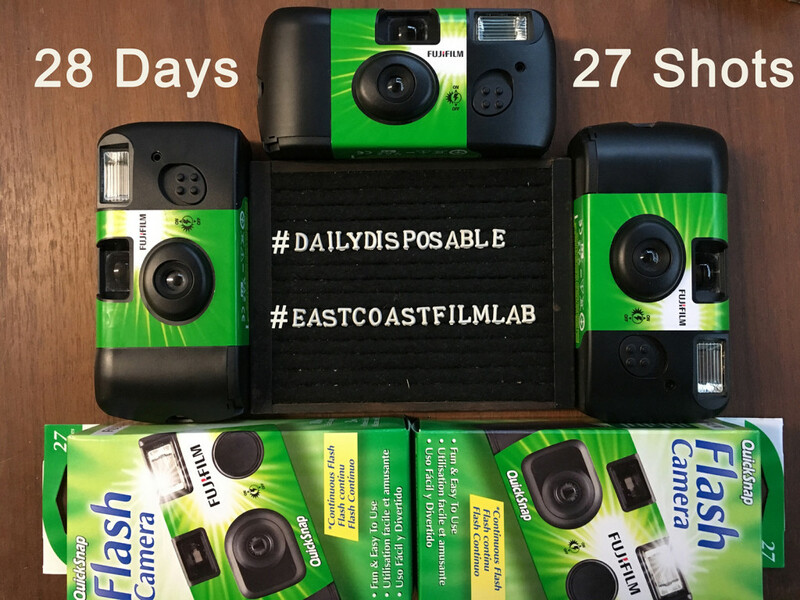 To “enter” the Daily Disposable Contest, you must stop by East Coast Film Lab on or before February 1, 2019. The entry fee is $25, but for that entry fee, you will receive One (1) disposable camera ($10.95 value), and the entry fee includes processing and scanning of this same camera ($15 value) at the close of the contest. Finished cameras MUST be returned to East Coast Film Lab on or before March 5, 2019 to be included in the competition. With your Daily Disposable camera, you are allowed to take ONE and ONLY ONE photo PER DAY during the month of February 2019. If you take that photo in the morning, and see something amazing later, you’re just out of luck. Or if you wait for the perfect image and the clock hits 11:59pm, you may as well take a photo of that. Because there are only 27 exposures, you do get one Pass Day. But don’t cheat. Don’t save them all for the end of the month, don’t just burn through them in the beginning. One per day. Keep it fair. We will know. This contest is as much about composition as it is selectivity. But don’t expect your gear to get you through. Everyone will have the same type of disposable camera, so it’s all down to your own creativity. Once all cameras have been received, or after March 5, 2019, everything will be processed and scanned, and uploaded to the individual’s gallery as usual, but each photo will also be added to a blind contest pool, to be selected by a panel of judges to be determined, or voted on publicly. Frankly we just haven’t decided that part yet, or worked out the logistics. By entering the contest, you agree to allow East Coast Film Lab to post your photos on social media and on our website (sea41film.com, but you know that because you’re here), although you still retain all ownership, copyright, etc. We won’t steal your stuff. GRAND PRIZE: At the conclusion of the Daily Disposable Contest, one Grand Prize winner will be selected. This Grand Prize winner will receive a gift card valued at $100 (one hundred dollars) to be used on anything at East Coast Film Lab. This gift card does not expire, has no associated fees, or any of that other stuff. As long as we’re in business and you’ve got a balance remaining, you can use it on anything at the shop. And that’s it! These “guidelines” are subject to change, once we decide how the judging procedure will work, but the rest will stay the same. $25, one camera, ONE PHOTO PER DAY, and $100 gift card to the best of the best. Let’s see what your #DailyDisposable will capture!